Now that the snow is disappearing, it is time to consider if your house needs a new coat of stain or paint. 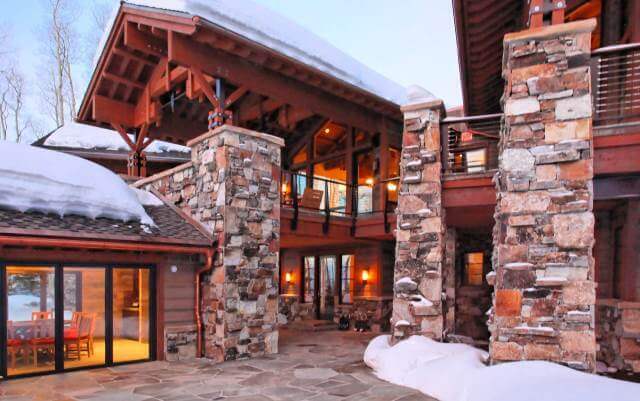 While Park City is a beautiful place to live and work, its climate is very hard on house exteriors. Bright sunlight and snow & rain can cause exterior finishes and woodwork to degrade rapidly. At Park City elevations exteriors should be stained at least every 3-5 years. Ultraviolet (UV) exposure increases dramatically with elevation. Most of Park City is between 7000 feet and 8500 feet above sea level. At these altitudes UV exposure can be 50% higher than at sea level. Think about how easy it is to get a sunburn on a blue-sky day at Deer Valley or Park City Mountain Resort; the sun has a similar effect on the exterior of a house. Stains add to the beauty of your home and also act as “sunscreen” for exterior woodwork. Without this protection, the wood quickly dries, cracks, discolors and must be replaced. These symptoms usually first occur on the South and West facing surfaces where sun exposure is highest. Please contact us for a free bid and/or an evaluation of the condition of the exterior of your house: (435) 649-8708. Exterior Staining Project in The Colony, Park City, Utah. 2018-03-16T18:56:18-06:00March 14th, 2018|Categories: Painting Info|Tags: Exterior Painting, Painter, Painting Contractor, Park City, Staining, The Colony, Utah|Comments Off on Is it Time to Re-Stain the Outside of My House?